I received some excellent news last week from a Health Minister called Steve Brine MP. He contacted me personally to say the new Secretary of State for Health, Matt Hancock MP, had accepted the recommendation of the UK National Screening committee, that screening for bowel cancer in England should be provided from the ages of 50 to 74; not from 60 years, as it is currently. It’s already 50 in Scotland but the DoH had been resistant to bringing the age down in England. However, this is important news and now, literally, lives will be saved in England where in the past, and currently, they’ll not be. It is also a testament to an extraordinary campaign by a young woman from Eastbourne, Lauren Backler, hose change.org petition to reduce the screening age has reached more than 470,000 signatures nationwide. An absolutely astonishing result. Lauren brought the issue to me within a matter of weeks of my re-election as your MP in 2017, and asked for my support. I was deeply moved by the passion she showed in her determination to get the Department of Health to reduce the age of bowel screening from 60 to 50 – which would have saved her mother’s life – and also by her focus on ensuring the campaign had support across communities, representatives from all the political parties and the country as a whole. I committed my support on the spot to helping make her dream happen. So I was delighted to hear the news from the Health Minister, not least as I had specifically challenged him twice in Parliament over the last few months to reduce the bowel screening age, helped deliver the hundreds of thousands of petitions to the Department of Health, and also lead in Westminster a successful cross-party Early Day Motion which received the support of 76 other MPs from across all of the parties. Well done Minister. An announcement from the government that was good news for a change. Thank you. And now they’ve made the commitment, I will keep the pressure up to get a fixed start date. It’s important to see the full details of the rollout, so it becomes a reality. I also had the pleasure of taking part in a game of blind tennis last week at the sports centre on Cross Levels Way. Really interesting. It’s sponsored by Eastbourne Blind Society and run by a super organisation called Defiant Sports. The balls are lighter and a bit slower, are either bright yellow for those with a visual impairment or contain a rattle inside to make a noise. This allows someone who is completely blind to play tennis. Absolutely fascinating, and it was good to see the members engaging so actively. The director of Defiant Sports, Loretta Lock, pointed out that just because someone has a disability it doesn’t mean they can’t play a sport - it just means we all have to be a bit more creative. Her commitment is to engage more people with disabilities in sport so if you want to give it a try, whatever your disability, go online to learn more. Their link is: info@defiantsports.org.uk Many congratulations to the Eastbourne Blind Society for their innovation. Hat tip also to Eastbourne Borough Council. A recent report listed those councils across the country whic have closed public toilets over the last few years and it makes for grim reading. Closures across the UK on almost an industrial scale and I think that’s simply wrong! Public loos may not be a subject we discuss much in polite company but their availability should be a priority for local authorities. For all of us, whatever age or gender, being caught short and not having access to a toilet is beyond the pale. I was delighted therefore to see that Eastbourne Borough Council is one of the very few authorities who not only have resisted cutting the number of available public facilities, but have actually increased them. Well done EBC. I’m really looking forward to Airbourne again this weekend. It’s such a popular event and, if memory serves me right, we’re now one of the largest airshows in Europe - and deservedly so. There’s always plenty to see and I’m sure you have your own favourites. For myself it’s the rather stately if not lumbering Lancaster bomber as it flies majestically past the massed crowds on the beach. Slow but evocative of a time when good versus evil seemed just, somehow more obvious, compared to today’s globalised fast-moving world with all its nuances and complexities. A wonderful sight. As ever I will be out and about with a collection bucket along with many other volunteers, so do please drop in a few coins or notes. It costs the council a lot of money to put on this free event and they’re wholly committed to doing so despite the stringent budget cuts from central government. Every penny counts and the bucket split is 30 per cent to local charities with 70 per cent going straight back into the Airbourne Fund to help pay for next year. I’m also looking forward of making a special point of thanking our brilliant seafront cleaners as I walk around. Trust me, they do an absolutely Herculean job every day to keep ahead of the mountain of litter which is dropped (sadly) on our beach and seafront, so I will make sure I thank them. Great people working hard for Eastbourne. That’s it folks. Have a good weekend and I hope to see you around town. 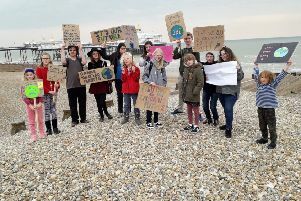 Climate change protest: will Eastbourne’s young people make pledge and cease to be driven to and from school?